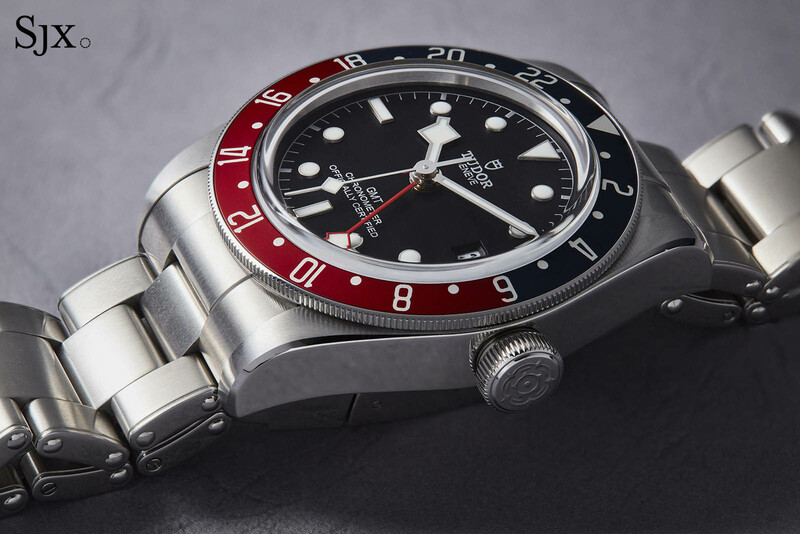 Twenty-eighteen was a big year for the “GMT” watch, with both Rolex and Tudor sharing the headlines for the simultaneous launch of their respective dual time zone watches at Baselworld. Rolex’s GMT-Master II “Pepsi” as well as the Everose and Rolesor versions were all hits. The Tudor Black Bay GMT, in contrast, is functionally identical and tremendously well made, but priced at a fraction of its cousin. Now that the initial hype has gone – the Black Bay GMT started to reach stores in summer 2018 – it’s time for a look at one of the best value propositions of late. The dimensions of the Black Bay GMT are identical to most watches in the Black Bay line, which means a diameter of 41mm and height of 14.6mm, exactly the same as the base model Black Bay dive watch. So it feels the same in the hand and on the wrist, which is to say largish. Before the launch of the 39mm Black Bay Fifty-Eight, the 41mm Black Bay case seemed moderate, but now it feels slightly big. Tudor’s designers, namely its chief of design Ander Ugarte, no doubt felt the same way because the case has been tweaked ever so slightly. The lower edge of the case middle is now bevelled prominently, sloping inwards towards the screw-down back. This reduces the perceived thickness of the case, by allowing it to seemingly sit lower against the wrist. An even more discreet tweak is the position of the dial relative to the crystal. 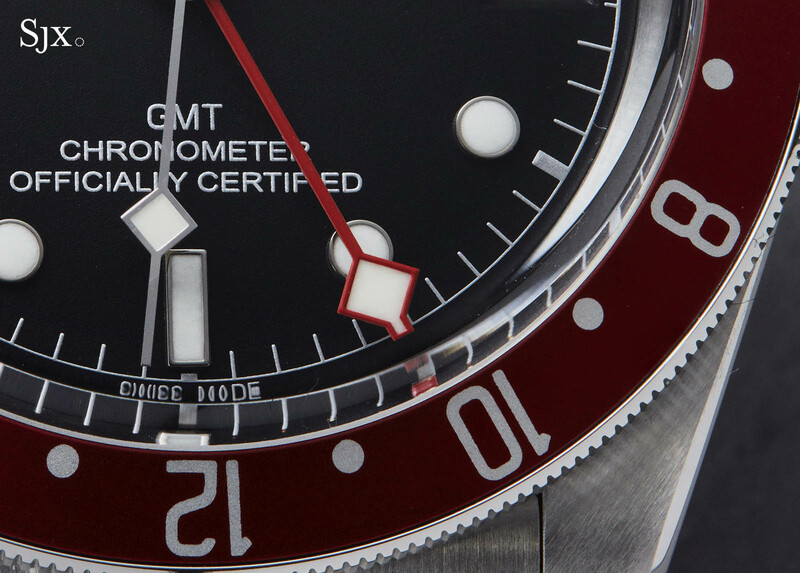 The dial of the GMT sits closer to the crystal than on the Black Bay dive watches, allowing the identically sized case, with an identically domed crystal, to accommodate a slightly thicker movement. 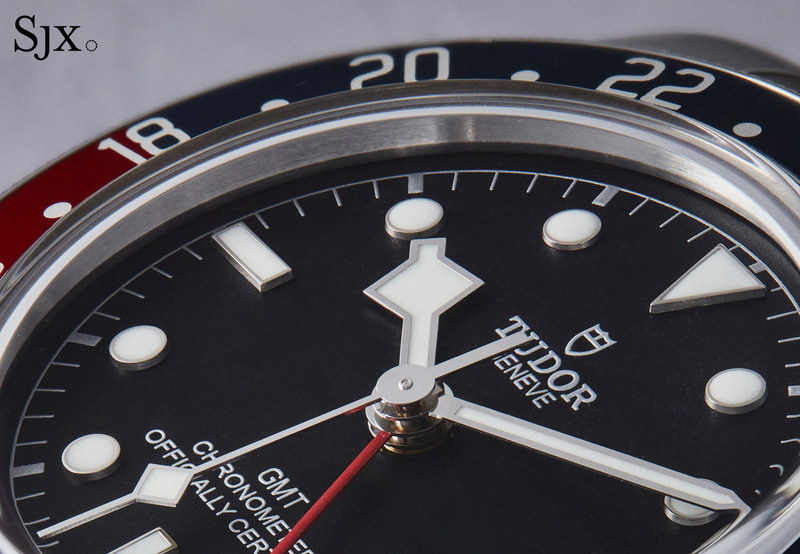 These clever and well conceived details reveals the attention Tudor devotes to refining its watches. And for those who like such things, the depth rating of the Black Bay GMT is a robust 200m, exactly as the same as the dive watches. Visually the Black Bay GMT also retains the styling of the line, most notably with its “snowflake” hands, including lozenge-shaped seconds and time zone hands. With three “snowflake” hands in total, it’s a little bit much but it doesn’t detract from the look. 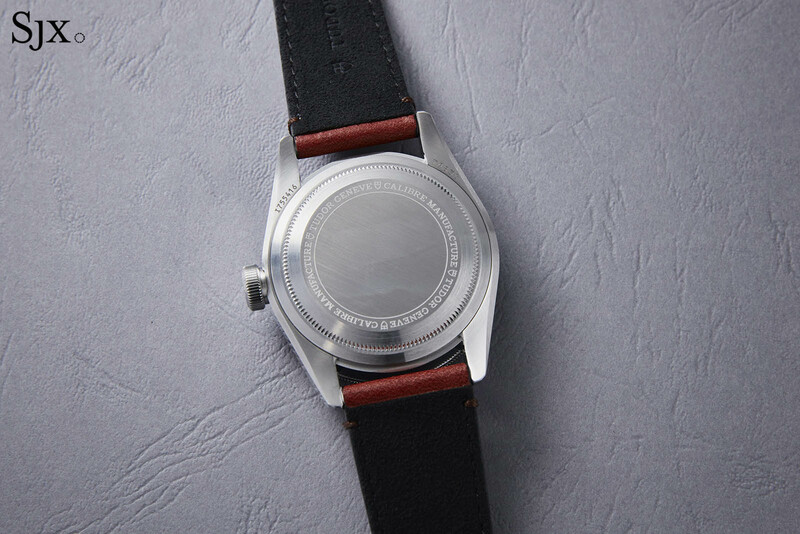 The hands, indices and print on the dial is done in matte silver, giving it a more modern and monochromatic feel than its counterparts in the Black Bay line that mostly have “gilt” dials. But a more significant, yet subtle, improvement was also made. 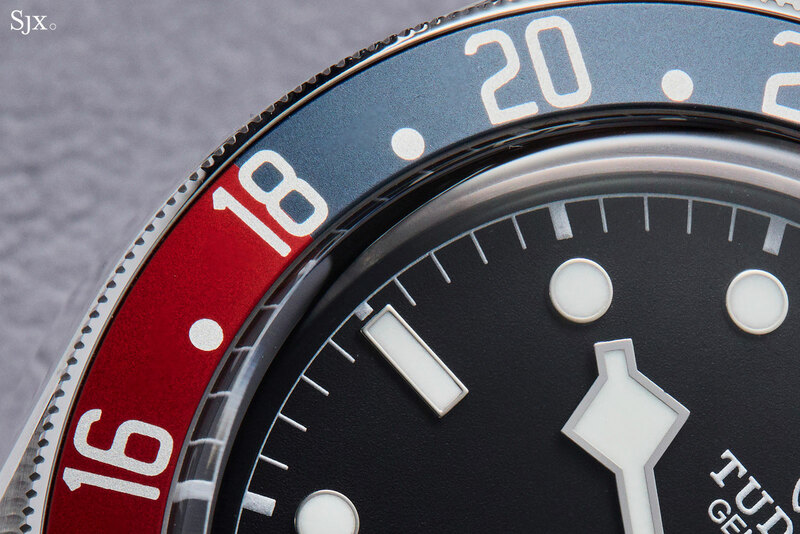 The hour markers and hands, while exactly the same shape, are smaller than those found on the dive watches, in order to improve legibility on a dial that is now more crowded. 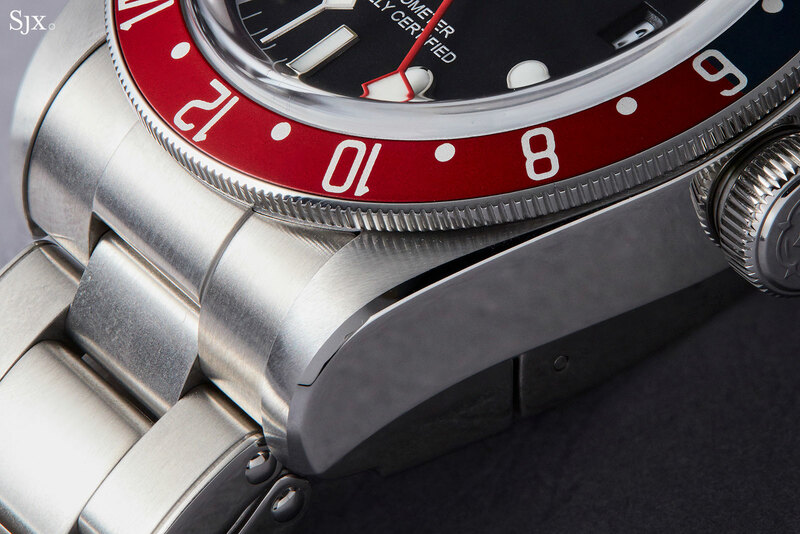 The bezel insert is anodised aluminium in red and blue, or “Pepsi” according to traditional GMT nicknames, but it is distinct from the Rolex “Pepsi”. While the bezel insert on the Rolex is glossy and bright, the Tudor’s is more restrained, with a matte finish and a dark, navy blue. Technically, the watch is a bona fide GMT, because the second time zone function is integrated into the base plate, and not an additional module. That, in turn, means the watch is functionally a bona fide GMT – the hour hand shows local time is independently adjustable in one-hour steps, while the red GMT hand shows home time. Modular GMT watches typically invert the function of the hands, making setting tedious. Setting the Black Bay GMT is easy. The first stop when the crown is pulled adjusts the local time hand, and also controls the date; turning the hand rapidly forwarded advances the date swiftly enough that it isn’t a drag to adjust. 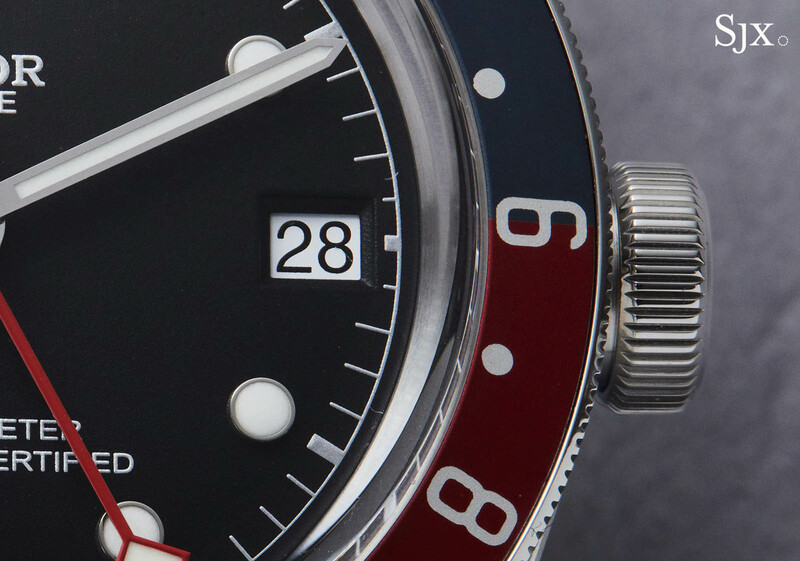 The second top adjusts both the hour and minute hands, with the red GMT hand moving in sync. It can track three time zones via the rotating bezel, which turns bi-directionally with 48-clicks. The movement inside is Tudor’s own. 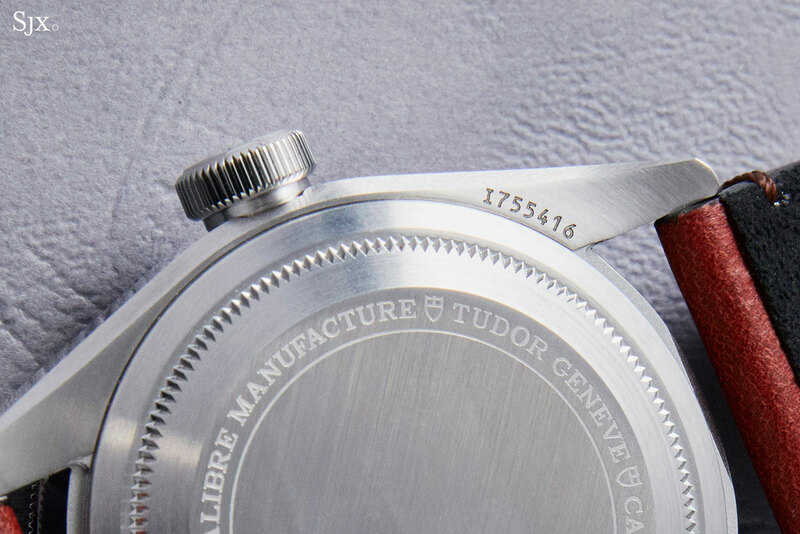 The MT5652 is part of the MT56XX family of in-house movements that power most of Tudor’s watches today. Like its siblings, the MT5652 is high spec, with 70-hour power reserve, non-magnetic silicon hairspring and a free-sprung, variable inertia balance wheel. Its features put it ahead of nearly all movements within the same price class. 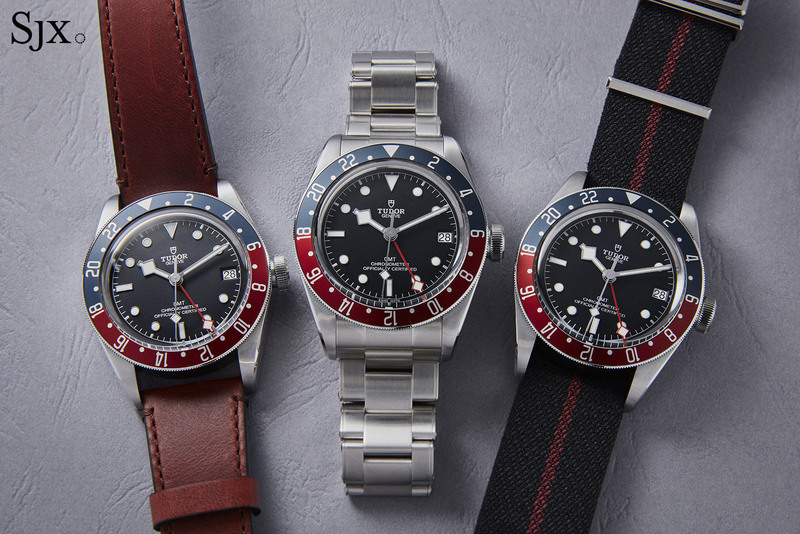 The idea of a Tudor GMT, especially at the time of its launch, created a bit of uneasiness, because of its proximity to the Rolex equivalent, and the fact that Tudor didn’t historically have such a watch in its line-up. 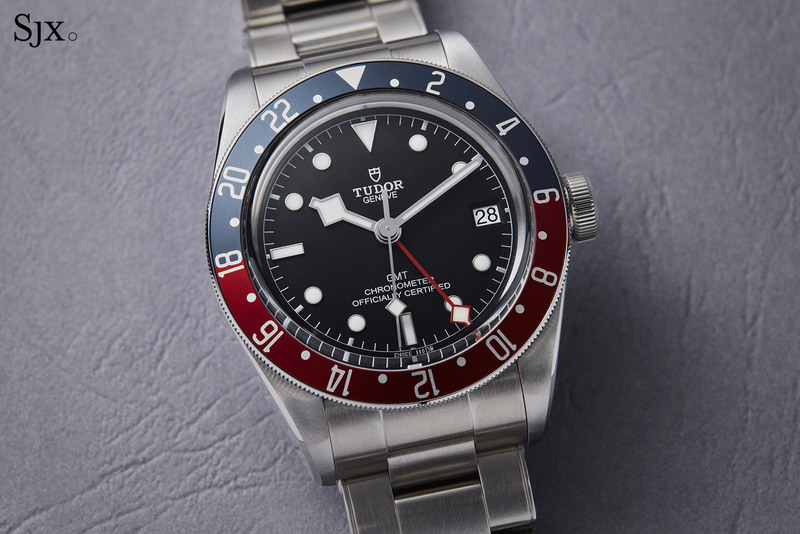 The Black Bay GMT seemed to run counter to Tudor’s gradually growing independence as a standalone brand. But the Black Bay GMT is an excellent product in all tangible aspects, in terms of quality, function and styling; it stands on its own. The Black Bay GMT (ref. M79830RB) is costs US$3900, or S$5328, on a steel rivet-style bracelet, and US$3575, or S$4896, on a leather or fabric strap. It’s available from Tudor retailers and boutiques.